There is just something about a good sunset over the Rockies that is almost magical. You get a pretty good view of it from where I was standing, but I’d imagine the view to be even better from one of those apartments! 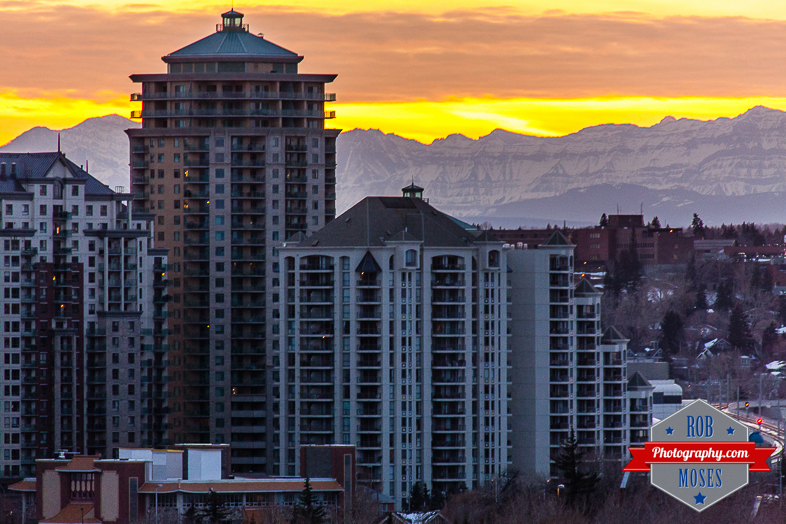 Those buildings are located on westside of downtown in Calgary, Canada. Nice location I’d say. This entry was posted in Cities and tagged 5D mark ii, 5D2, 5Dii, Alberta, amazing, apartment, apartments, architecture, beautiful, buildings, Calgary, Canada, canadian, Canon, city, City Life, clouds, condo, condos, metro, mountain, mountains, natural, nature, neighbourhood, photo, Photography, pretty, rockies, Rocky, Rocky Mountain, rocky mountains, sky, Skyline, skyscraper, skyscrapers, Snow, street, sunset, Urban, view, winter, wow, yyc, zoom. Bookmark the permalink. The west-side apartments on the upper floors of the tallest buildings must go for a loonie or two . . .
Great photo–as always . . .
Haha ya I’d say a loonie or two for sure! Such a great view:) The sky is fantastic!